Can you be hypnotized to forget someone and BREAK THE CYCLE THAT BINDS YOU? Hypnosis has the ability to remove negative thoughts and feelings about a bad relationship from your past. The Overcome Bad Relationship Memories Hypnosis MP3 does this by erasing the memories associated with the relationship and thereby helping you feel better about future relationships. Call it what you will – excess baggage, post traumatic stress syndrome, or just an overly cautious approach to dating and relationships. If you have been hurt or mistreated by a past relationship the memory of it can impact future relationships more than you may realize. If you are unable to be successful in your current relationships or don’t even want to take the next step toward a new relationship, then hypnosis can help by erasing the pain from the memories from the past that are holding you back. This self-hypnosis program to erase bad memories uses skilled techniques to tell your subconscious mind to forget what the conscious mind would love to let go of. The first stages of hypnosis begin the same for everyone. A deep level of relaxation must be achieved through creating peaceful images in your mind. A soothing voice that builds calming pictures in your mind will prepare you for a hypnotic script that literally tells you to forget those bad relationship memories. 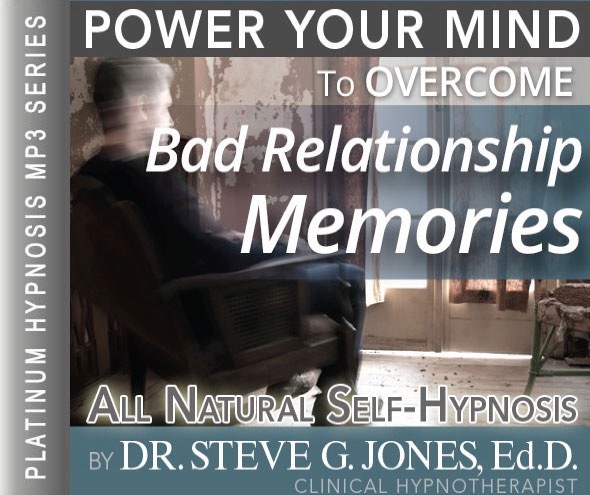 Dr. Steve G. Jones, a clinical hypnotherapist, has created the program that anyone who has bad feelings and memories from a past relationship can benefit from. The mp3 titled, “Overcome Bad Relationship Memories Hypnosis MP3” literally removes memories you want to forget over the course of three weeks. Should the memories start to creep back into consciousness, then you can replay the program as often as necessary to let hypnosis remove the barriers to your future relationships. This will give you the jump-start you need. 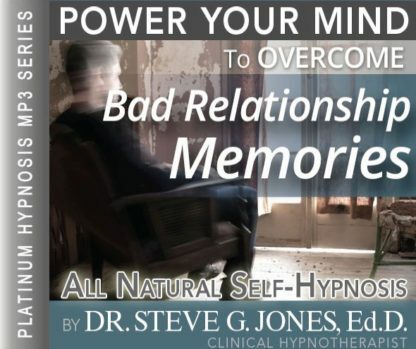 Dr. Steve G. Jones, Ed.D., Clinical Hypnotherapist, charges $1,500 for a custom recording and $25,000 for a one-hour private hypnotherapy session at his office. But you can get all the benefits for this low price. Simply listen to the Overcome Bad Relationship Memories Hypnosis MP3 session every night as you go to bed for three weeks and feel the changes happening in your life. You will feel more empowered, more in touch with your true self, and you will truly know that the love you want is within your reach. This is the same hypnotic technique he uses with busy professionals, Hollywood actors, and people like you who are ready for a positive change NOW! The idea of erasing bad relationship memories was explored imaginatively in the Academy Award-winning 2004 movie Eternal Sunshine of a Spotless Mind; and although the methods in the film were fictitious, hypnosis is actually a realistic method by which you can escape the ill-effects of harmful, persistent memories relating to toxic or sour relationships of your past. And this means, no more letting those bad memories negatively influence your behavior and feelings of TODAY – and TOMORROW. Don’t wait, do it NOW !!! you’ll be glad you did. See you at the top! Do you have a past relationship that you want to forget? Perhaps you were once in a toxic relationship and you want those memories to just disappear. Most of us have had a few bad relationships in the past and afterwards it is often very difficult to move forward. Memories of a bad relationship can keep us from enjoy all that life has to offer and can keep us from finding true love. Imagine moving past these bad memories. Imagine erasing these memories completely from your mind. Picture yourself moving on and enjoying your life again. That toxic person is no longer a part of your life and no longer in your thoughts. Now you can move on. You can learn to overcome these memories of the past! And as you continue relaxing deeper and deeper and more deeply relaxed, you begin to realize just how powerful you are, just how powerful your mind is. You have a very powerful mind. And I’d like you now to realize that you can erase any part of your mind, any part of your memory that you choose. And as you take control of your mind, erasing a certain part of your memory, you feel very empowered. I would like you now to imagine that your mind is a computer screen and you can type in the name of a person and all the memories concerning that person will appear on the screen and if you erase all of those memories then nothing will appear on the screen. But notice as you type in their name, notice what appears on the screen. I would like you now, in your mind, to realize that on this computer screen, each of these memories has a little box next to it and you now use the mouse and click on the boxes next to the memories you choose to erase, that’s right. And as you click on those boxes and you now hit the enter key, those memories are now erased. And day by day, those memories will fade more and more, that’s right. And as you practice this exercise, you will become more skilled at erasing those memories of that person, that’s right. And very soon indeed those memories will be permanently erased forever, allowing you to live a wonderful, exciting, empowered, and happy life, that’s right. Because those memories will be gone completely, allowing you the freedom to have joy in your life, to have power in your life, to have excitement in your life, that’s right. Because you have chosen to erase those memories of that relationship forever. So relax now and realize that the computer of your mind, the powerful computer of your mind has been instructed to erase those memories that you no longer want or need. So relax and realize that this will happen easily and effortlessly because you are in charge of your mind and those memories you no longer want or need are now instructed to leave your memory forever. If you have been in a bad relationship that has affected you deeply and you want to completely rid yourself of the memories, then look no further; this self-hypnosis recording is for you. Your mind is very powerful. You can use hypnotherapy to get rid of the negative memories that are holding you back. Whomever this person is who you want to forget, this self-hypnosis program will help you forget them… permanently! The Overcome Bad Relationship Memories Hypnosis MP3 download is a safe and natural way to improve yourself. Relationships can get messy and hurtful things can occur. Hypnotherapy will help you move past your hurtful relationships so that can focus on new and positive relationships. It is really as easy as that. Listen to the recording each night for 21 nights and allow the suggestions to take effect. Whether you want to get rid of memories involving a lover, family member, or friend, hypnosis is the tool to use. You will learn how to use hypnotherapy to erase memories in your past. Remember, you are in complete control and you will be able to erase any memory you do not want and you will have control over which memories you want to keep. You are always in control with hypnosis! In just three short weeks you can overcome bad relationship memories and make positive changes in your life! You will want to listen to Overcome Bad Relationship Memories Hypnosis MP3 session for 21 nights in a row as you go to bed. The powerful suggestions will begin to make an impact on your life immediately. Negative events in past relationships can have a negative impact on your life, but it does not have to be that way. You are in charge of making a change. You cannot change your past, but you can forget the negative memories and start moving forward. Your life will be much more fulfilling when you can move past negative experiences.